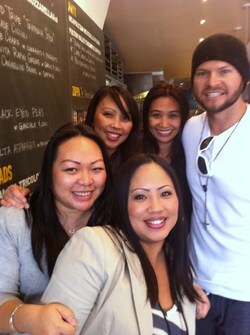 According to a tweet, @MsJubi spotted and snapped a pic of “super nice” ~Cody Ross~ of the Giants at Delfina (her “fav lunch spot”). ~Pat Burrell~, the Giants leftfielder, dined at Ozumo San Francisco “with a lady friend” on Thursday night. He was reportedly low key, and was just drinking water since he was playing on Friday. Over at Quince, ~Ichiro Suzuki~ of the Seattle Mariners came in to celebrate winning a game—he is reportedly a big fan of chef Michael Tusk’s risotto.